Having a game table ensures that you are never at a lack of entertainment. If you are thinking of having a gaming room in your house, a pool table would prove to be just the thing that would add finesse to the room. 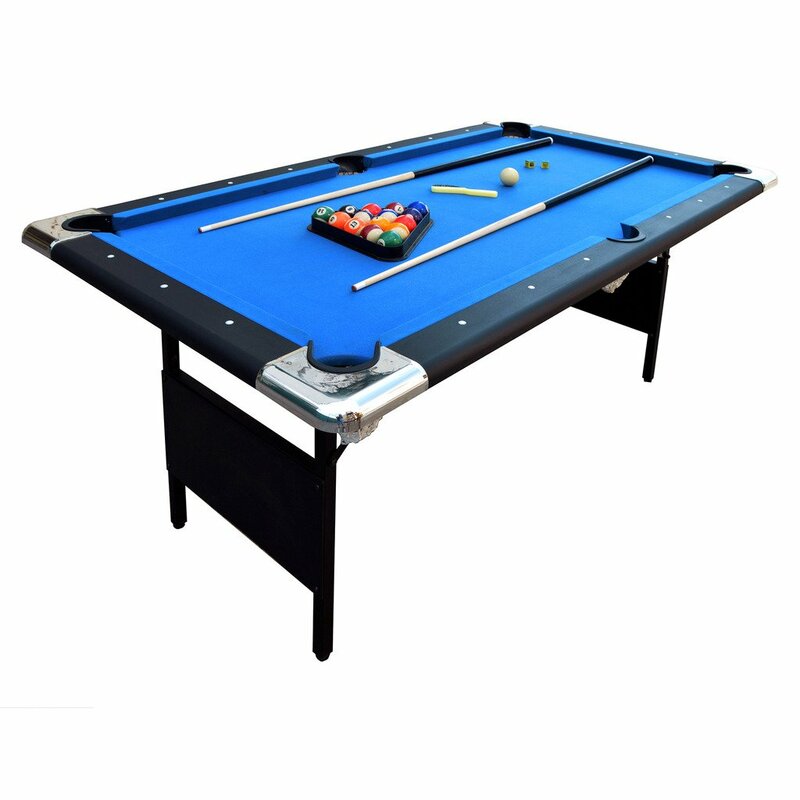 If you have your own table, you can play pool whenever you feel like it and would also be able to entertain your guests with a game as per your convenience. While purchasing the table, there are a number of things that need to be taken into account. You have to ensure that the table is of profound quality and is sturdy. You have to make it certain that the table would not develop resistance to the ball within a short span due to bumps. You need to ensure that the pockets would not stick to the ball. You also have to keep in mind the size of your room and buy the table in accordance to that. 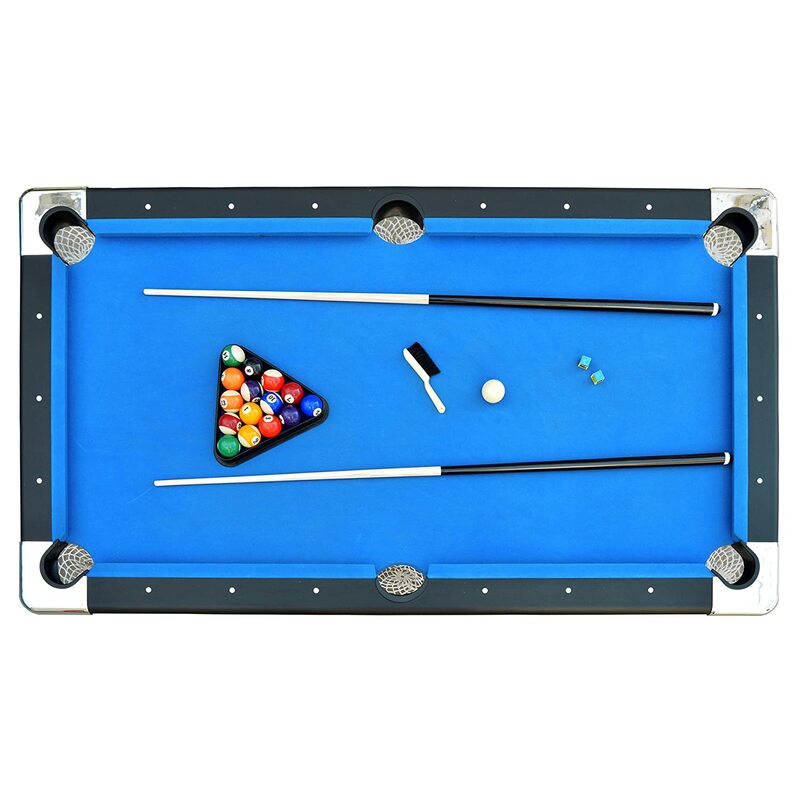 If you are looking for a folding pool table that would not let you down with regards to quality and would be apt for a small room, you should take a look at the Hathaway Fairmont 6-Foot Portable Pool Table. This portable table ensures that it does not occupy a lot of room so that the room does not give the impression of being stuffed. You can easily place it in a corner. It is a folding table that ensures that keeping it in a small room is not a problem. Despite its portability, you would not find the table to be lacking in sturdiness. It is rather strong, and you can lean on it while playing without any worries. This 6 foot table reeks of high quality. The playing surface is poly sealed with blended polyester and wool. You can be certain that your game would not suffer due to unevenness of the table. In addition to this, the design is rather stylish, which adds the element of style and fashion to your room. Available in matte black melamine cabinet color, the table has chrome plated corner castings with rope net pockets. One look at the table would give you the impression that it is a kids pool table. However, this is far from the truth. In fact, you will find that playing on it is rather challenging. The table is filled with features that you get with much larger tables. The portability and folded leg system ensure that you do not have to face any problem in keeping it. This foldable pool table gives you your money’s worth and ensures that you are not disappointed with the results. It is sturdy and durable, and you can be assured that it is going to last with you for a long time. Its high quality makes it all the more easy and convenient to enjoy a good game without any worries. This fold up pool table can be used by children and adults alike, and you can be certain that all will have a blast while playing on it. The look that this product has thanks to its design ensures that it adds a flair and style to the room that you keep it in. While it is certainly one of those products that hardly seem to disappoint, there are few people who have had a bit of trouble with it due to its weight. This 6 foot table is rather heavy due to which you need the help of someone to set it up the first time around. Carrying it around does not seem to be a job that is meant for one, even though it is supposed to be portable. 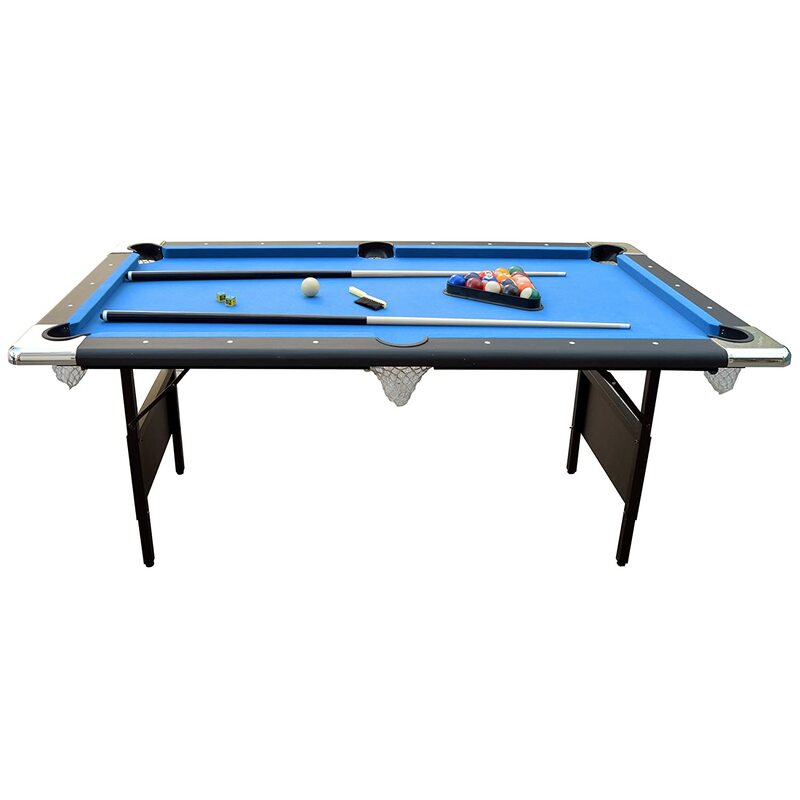 On the whole, this folding pool table does not disappoint and manages to score points in all aspects. Whether we talk about its design, style, quality, or sturdiness, the table manages to shine in all aspects. It is one of those tables that does not compromise on any aspect despite being affordable. 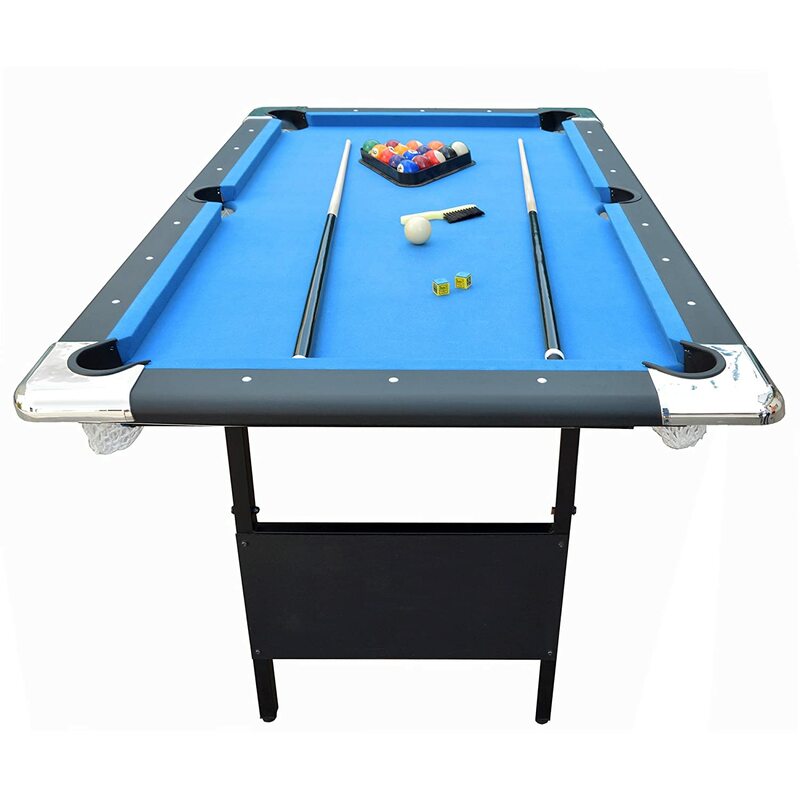 It is indeed a foldable pool table that would prove to be a valuable addition to your gaming room. You cannot go wrong with this decision.